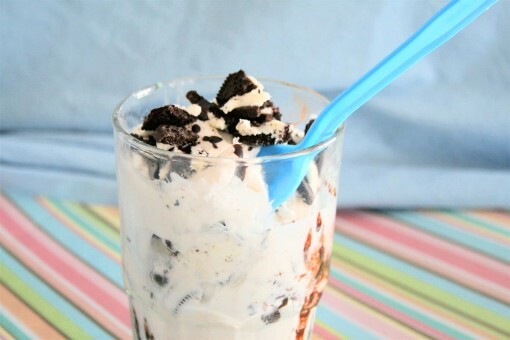 Vegan Ice-Cream Oreo Blizzard was posted on January 19th, 2011 and is filed under Dairy Free, Desserts, Gluten Free, Kid Friendly, Recipes, Vegan. This entry has 14 comments. You can follow any responses through the RSS 2.0 Comment Feed. Who else likes ice-cream? Unfortunately, I recently found out that my body does not handle dairy very well. I went to an allergist who told me to avoid it…like long-term avoiding. I’m not too heartbroken, but I must say there are things I miss… yogurt, for one. Then of course, there’s that splash of milk in my tea or coffee that I love. Then there are those lovely puddings and custards and I wonder if maybe, just maybe…I miss milk a little bit. Then I remind myself that most of those things aren’t that healthy for me anyway…and that cow’s milk isn’t the greatest invention on the planet. But I still miss it a teeny, weeny, little bit. Thankfully, I can improvise. In fact, I like to invent new versions of old favourites, and I prefer to make a simpler, quicker version than the original. I don’t like time consuming recipes. Once I’m free of the kitchen there are so many other lovely things to do. Enter my take on dairy-free ice-cream. Be prepared. 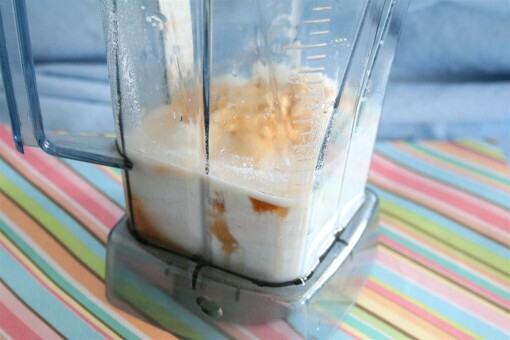 Directions: Whirl up all your ingredients up in the blender. Pour into your ice-cream maker according to manufacturer’s instructions. Then gather up these three ingredients for the chocolate sauce you’re going to swirl into your ice-cream. Take a heaping tablespoon of coconut oil and melt it in a small pot on low heat. 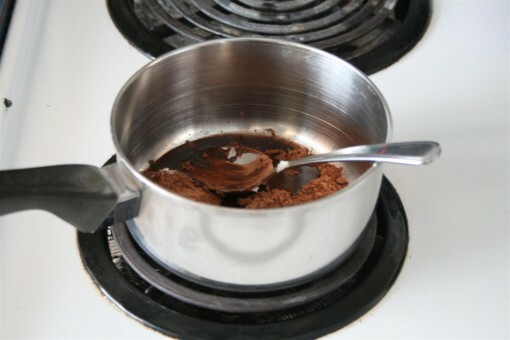 Add 1-2 teaspoons of cocoa and as much agave nectar as you like, to the sweetness you desire. I used about a tablespoon of agave. Stir it up. 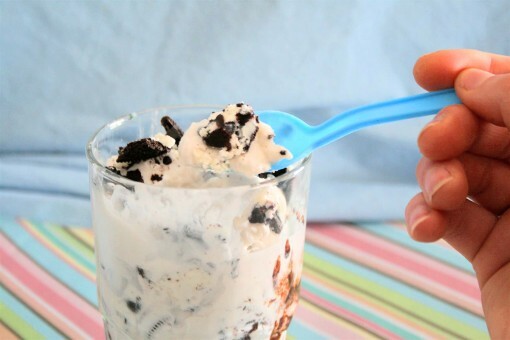 Now when your ice-cream is done, put the amount you want in a bowl and swirl some of that chocolate sauce into it. The sauce should harden a bit, kind of like that Magic Shell stuff I used to love. 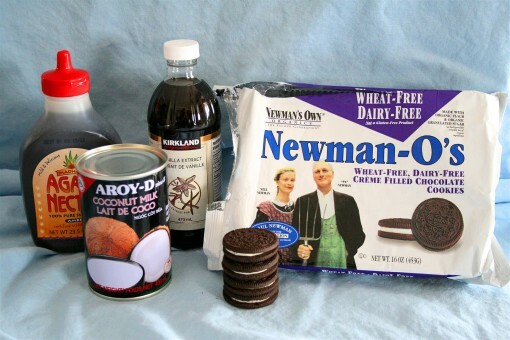 Now add your Oreo cookies and mix that in too…mmmmm, who needs Dairy Queen anyway? Yes, yes, and yes – This looks amazing! 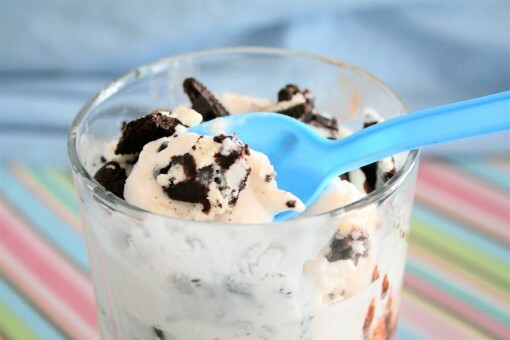 yummmm , the ice cream looks amazing !!!!!!!!!! Wow this looks amazing. Excellent treat. This looks great! Definetly need to try this one! Wow, I would not have guessed in a million years that this was vegan. I am not allergic to dairy but I do have to use a lot of alternative ingredients to remain low carb (sadly, I am diabetic). I love coconut milk and almond milk. Have yet to try ice cream with them but I plan to! This looks so good and sooo easy! I don’t own an ice cream maker though, so can I still make this? Thanks, love your recipes! Yummy~ For sure! Just put it in your freezer and stir it once in a while, while it freezes! I do this all the time…enjoy! is there a sub for agave? I don’t have any of that on hand, but would like to make an afternoon treat for the kids.